Well the election is over and we can start planning seriously for the next few years as we develop as a party. And we watch anxiously as Europe goes through so continual financial crises. We have had our first skype call among those who were involved from the start and now have to plan to build our membership to 500 so we can register. We are also working on a form to register properly for the party and where people can donate money. And our IT team is connecting us to Facebook and Twitter and everything. Everyone who joins the website is sent an email and we are learning about the range of people that this attracts - ex Greens, climate change activists, peak oil transitioners, tweeters, bloggers, Max Keiser fans, students of human evolution and consciousness, Georgists, monetary reformers, thinkers, businesspeople who care for the earth. We have an enthusiastic fan from Greece and ongoing encouragement from some in USA. Frank de Jong, the leader of the Greens in Ontario for 16 years, and now president of Earthsharing Canada has made contact and sent us his calculations on how they could raise $210 billion in resource rentals from oil, land value, Tobin Tax, other resource rents, infrastructure access and Pigouvian taxes to equal the revenue they currently raise from income tax, corporate tax, GST and other sources.. (Yes there was an economist called Pigou) It makes sense not to tax work. Ridiculous. But those who take from the commonwealth must contribute to the common good in equal measure. And we would add excise taxes from tobacco and alcohol as before and have a tariff for climate change too. Frank's calculations raise rent from oil, tar sands, natural gas, land, trees, fish, minerals, EM spectrum, internet, stock markets, patents, quotas, licences, and the Pigouvian taxes include roads, parking, docks, towers, wires, landfills and water. 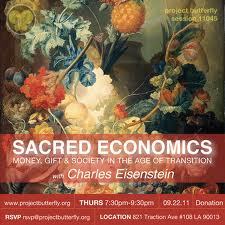 Today I was reading Sacred Economics by Charles Eisenstein, a brilliant 2011 book available from Living Economies. He sees resource taxes as internalising the true cost of production so that the public doesn't pay the cost while the business reaps the profits. "I use the water, irrigate my dairy farm, keep the income and the public pays the cost of depleted aquifers and polluted rivers" would be our equivalent. He says as long as we think of ourselves as separate from others and from Earth we will have this view that I keep the income and someone else pays. "But from the perspective of the connected self, connected to other people and to the earth, your well-being is inseparable from my own because you and I are not fundamentally separate". His online course at http://evolverintensives.com/upcoming/ce-sacred-economics.html starts tomorrow! Laurence is working on the Living Economies sector (April 12-13) of the Australasian Permaculture Convergence being held in Turangi next year (April 11-15) and the New Economics Party will be among those participating. He is also working to find a place where our party members can all stay together, and have our session on Friday 15 April. This entry was posted in New Economics Party and tagged earthsharing, Eisenstein, NZ election, permaculture, resource taxes, Sacred Economics by Deirdre. Bookmark the permalink.